For the base, use a standing mixer or a hand mixer with dough hooks to mix flour, cold butter, and some of the salt. Beat in cold water. Then knead dough by hand until smooth. Wrap dough in plastic wrap and cool for approx. 30 – 35 min. Preheat oven to 200°C/ 400°F. In the meantime, halve the pumpkin, remove seeds, and cut the flesh into small, equally sized cubes. Now, in a large saucepan, add pumpkin, sugar, remaining salt, spices, and heavy cream. Bring to boil, then reduce heat. Cover with a lid and let simmer on low heat for approx. 20 – 25 min. until the pumpkin is soft. Stir regularly. Blend the mixture with a hand blender. Set aside to cool down. If needed, grease tart dish with some butter. With a rolling pin, roll the dough into a round that is a little larger than the tart tin. Work on a floured surface and turn the dough a couple of times to prevent sticking. Lay the dough into the tart dish, leaving an edge. Press the sides firmly into the dish. Cut off overhanging dough by rolling the rolling pin over the edges of the tart dish. In a large bowl, whisk together eggs and blended pumpkin mixture. Pour the filling into the base and bake at 200°C/ 400°F for approx. 15 – 20 min. Then reduce heat to 170°C/ 340°F and continue baking for approx. 35 – 40 min. 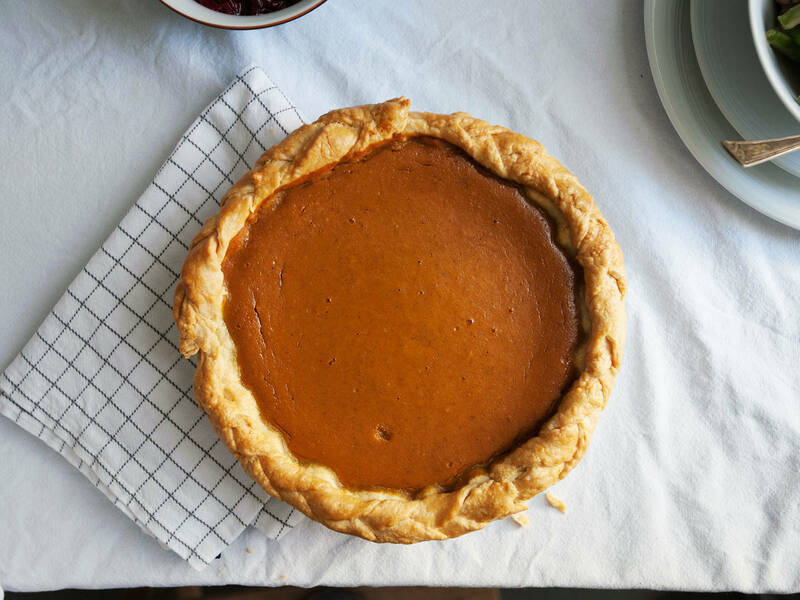 Leave pie to cool down. Enjoy warm or cold with a dollop of sour cream.